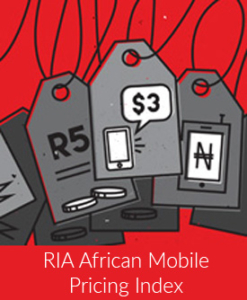 RIA created the BVI as a means to capture the value of combined data, sms and voice packages on offer. Given the complexity as well as increased number of products on the markets, only bundles offering data combined with voice and SMS or, data and voice, or data and SMS are captured. Previously RIA used the OECD price basket to capture and assess voice and SMS bundles. Blended packages which include data, however, cannot be captured on the OECD basket given the different in-bundle and out-of-bundle prices. Adding data to voice baskets does not reflect the value for data use accurately. BVI measures the value a customer gets for bundled minutes or SMSs and data per month. OECD usage baskets that RIA uses for prepaid products are based on minute, SMS and data tariff capturing the monthly basket cost. The BVI complements this as it calculates the value for the blended bundle, beyond monthly basket cost. Uncapped SMS = 240 SMSs a day or 7200 per month.